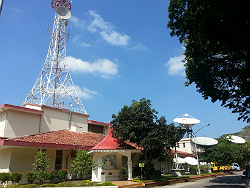 Colombo Sri Lanka: DSNG/OB transmission/production hire. around the country, a journalist can send video reports from outlying areas to the capital, Colombo, in just a matter of minutes. 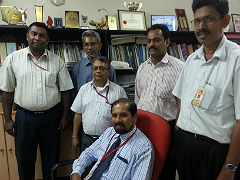 However, when the video files reach Colombo, that's where modernity stops. For the files have to be downloaded and then converted onto a tape in order for the video to be played on air. It's a frustrating problem but one that is about to change. 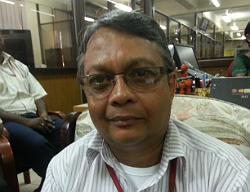 Palitha Fernando, Deputy Director Engineering, told TVZ: "We're now looking for a newsroom automation system. We hope this will be done within the next six months to one year." Automation will help the newsroom to process the large number of video reports it receives each day. In addition to receiving international footage from AsiaVision and Reuters, Mr Fernando said: "We have our own team of about 200 freelance correspondents around the island and each day we receive about 50 reports that are FTP'd to our server." The broadcaster also receives regular reports from the President's office which are, likewise, sent to a FTP server. 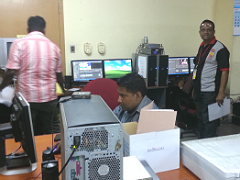 For coverage of planned diary events, Rupavahini has its own ENG crews based in Colombo aided by microwave and DSNG equipment. The broadcaster also possesses three Outside Broadcast (OB) vehicles - the largest of which has eight cameras. The transmission equipment is available for hire to foreign broadcast companies. For details please click here.